Address: 300 Municipal Drive, Madeira Beach, Florida. Get driving directions from Google Maps. From Clearwater (north): South on Seminole Boulevard to Bay Pines, west over causeway to Madeira Beach, turn right on Madeira Way, first right onto Municipal Drive, to Madeira Beach City Hall. From St. Petersburg (south): West on Tyrone Boulevard onto Bay Pines, continue west over causeway to Madeira Beach, turn right on Madeira Way, first right onto Municipal Drive, to Madeira Beach City Hall. From Tampa (east): I-275 south to Park Boulevard (Gandy exit), west to Seminole Boulevard, south to Bay Pines, west over causeway to Madeira Beach, turn right on Madeira Way, first right onto Municipal Drive, to Madeira Beach City Hall. There are several options for parking near the start line. Metered parking is available at Archibald Park. There is parking available throughout Taylor Park. Will operate from 9:15 a.m. – 12:00 noon, transporting finishers from the finish line at Taylor Park back to the half marathon start in Madeira Beach. Start time is fifteen minutes after sunrise. The course tours through exclusive residential neighborhoods and commercial areas on Gulf Boulevard. Fred Marquis Pinellas Trail is the longest “rails-to-trails” linear park in the country. Taylor Park is a beautiful setting to finish the Florida Road Races Holiday Halfathon. Click here for a “Mile by Mile” overview of the course. Coming soon, please check back for our Spectators’ Guide to cheering on your favorite runner. We require that runners and walkers be properly prepared and trained to finish the half marathon within 4 hours (18 minute/mile pace). Please note that 4 hours after the start, course support (i.e. aid/water stations, volunteers, course marshals, clocks, etc.) is not guaranteed. All our races are sanctioned and insured through USATF for runners, joggers, and walkers ONLY. Strollers, skaters, skateboards, bicycles, or dogs are NOT allowed on the course during our races. Both half marathon/relay courses have been precisely measured and documentation provided according to USATF requirements, certifying our courses as accurately measured. All official results will be based on “Gun Time” as per USATF rules. Chip times will be posted for our athletes’ review, but NOT used for scoring. Celebrate your success at our super-fun post-race party. Replenish with our delicious pasta and meatballs (vegetarian option available), beer, breakfast foods and fruits. Enjoy live music while you mingle with other runners. 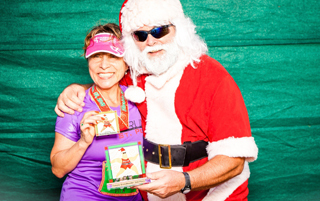 Stay around for Santa’s awards ceremony in case you win in your age group. You just may receive another medal or trophy!